Designed for FM radio transmitters, this amplifier uses the new BLF174XR from the extra rugged NXP series to produce a minimum of 600W! In a design where performance and efficiency was top priority the cost of this product remains reasonable. This product is provided for experienced FM transmitter fabricators only. If you are not experienced please buy a complete module or a rack-mounted completed amplifier. 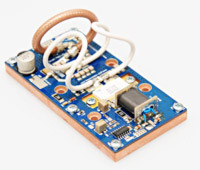 - Due to the High gain of this pallet, a good shielding between final stage and any driver/low power stage is required. Please foresee a good RF choke also on the supply wiring. - Excessive drive level can damage this amplifier; design of equipment where the amplifier will be mounted must foresee an appropriate protection circuits. - Amplifier efficiency is function of supply voltage, in order to obtain max efficiency please reduce supply in function of desired output power. Generally best compromise between efficiency and harmonic emission, is obtained when the amplifier work at about 2-3 dB of gain compression. - RF pallets are sensitive devices, if you do not have sufficient experience please consider a finished product instead. They can be burned by applying too much drive power, too high supply voltage, not using proper heatsink, using filter with unsufficient specifications, connecting mismatched loads or no load at all and also by soldering coax with too long leads. For this reason there is no warranty for any pallet. We do assure you that every pallet is tested and is 100% operational as it leaves our workshop.